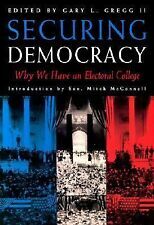 Get Schooled on the Electoral College! What do Presidents John Quincy Adams, Rutherford B. Hayes, Benjamin Harrison, and George W. Bush have in common? None of them won the popular vote during their respective presidential elections. However, the most “popular” person (a.k.a the person with the most votes) doesn’t always win. For some of you, this may be your first time to vote in a presidential election. Maybe you’ve heard the term “Electoral College” but have no idea what it means. The United States Electoral College is the establishment that elects the President. The Electoral College consists of 538 electors from the fifty states and Washington, D.C. A majority of 270 votes must be received by a candidate in order to win the presidency. The Electoral College was established to make sure that the voters in the smaller states have a voice. Also, it prevents a candidate with only regional appeal from winning. The Electoral College is not without controversy. Some pundits feel that the United States should go to a system of a direct popular vote. Others say a change would hurt the less populated areas. What do you think? As always, before voicing your opinion, we encourage you to do your research! School yourself on the Electoral College by researching the topic before you start a conversation at the family dinner table. Thigpen Library has plenty of resources. We recommend starting with the Credo Reference Database, Issues and Controversies in American History Database or the books listed below.